Mother/daughter relationships are complex things, and often make for fascinating and emotionally compelling entertainment. Just look at Grey Gardens, ‘night Mother and Mommie Dearest, to name a few. Something about this familial dynamic, especially when it’s dysfunctional, brings out the best (and worst) in actresses. This is the case with Martin McDonagh’s dark (and I’m talking dark) comedy, The Beauty Queen of Leenane. 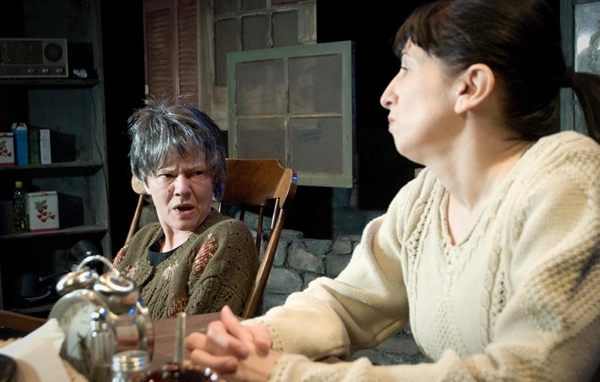 Linda Reiter and Eileen Niccolai are giving blistering performances in Shattered Globe’s immensely disturbing production as a dueling mother/daughter duo who are committed to duking it out to the grave. As many know, Shattered Globe had a brief flirtation with shuttering down late last year, as was announced in many press materials, including a recent Footlights program. But the board bandied together and have given it another go. And I’m so glad they did. This is my second Shattered Globe production (read my thoughts on their production of Sam Shepard’s Buried Child), and it’s clear they are among the best small companies in the city. Warning: the Atheneum’s upstairs theatre has the most uncomfortable seating arrangement of any theatre I’ve ever sat in. There is virtually no leg room, and my 6’2″ frame had to sit contorted during the entire 2-hour running time. Luckily, the strength of the performances kept my mind on the stage and away from the seating situation, but still. I’m trying something new for 2011 — a CTA Index Rating. I’m going to rate each show on a ten-point scale. This way, I will be able to more effectively track my theatre-going habits and history. I’m just glad for Linda it was a wig!! Don’t feel bad. My 5’2 frame with my short legs sat in those seats for a production of “Macbeth,” and it was so uncomfortable I’m basically set on never going there again unless it’s a show I simply MUST see. Apparently the space was built for children. Unbearable.